My boys LOVE the great outdoors. As a parent, I want to teach them to be responsible stewards of their beautiful Earth. Earth Day is a great opportunity to celebrate and remind ourselves about our responsiblity of taking care of our Earth. We recently checked out a few Earth day books from our local library. One of the books, Earth Day Crafts by Carol Gnojewski was an awesome inspiration to us. From this book we created our trash monsters-- which were based on the trash people in the book. The idea behind this craft is to set your trash monster person near your trash can. Before you throw things away, this little dude will remind you to think about the things in your trash that can be reused. The second craft we did was based on the book's slick water wearable. The book has directions for creating a cute little necklace with an important message. I adapted this to my preschool boys. We created a plastic water bottle with clean water on the bottom and oil on top. We added foil fish to our display and talked about what happens when oil (or other debris) is added to water where animals live. Earth Day Crafts by Carol Gnojewski is more than just a craft book. This nonfiction text provides a brief introduction of the history of Earth day. The books showcases 10 crafts about Earth day. There are also instructions for Earth day games your child can play using the crafts he made. There are additional resource pages listing books about Earth Day and internet sites about Earth Day. This book is also a great way to introduce your child to nonfiction text features such as a table of contents and an index. One thing I enjoyed about this book is that each craft or activity includes a short informational paragraph. Each craft teaches a different concept about being eco-friendly. The vocabulary that is introduced in context in this book is wonderful. After reading the book, your child will be exposed to words like foodshed, recycling, landfills, endangered and extinct species, greenbelt, and more. The reading level is probably best suited for 7 and above but even younger kids will enjoy the projects as well as hearing snippets of the text. 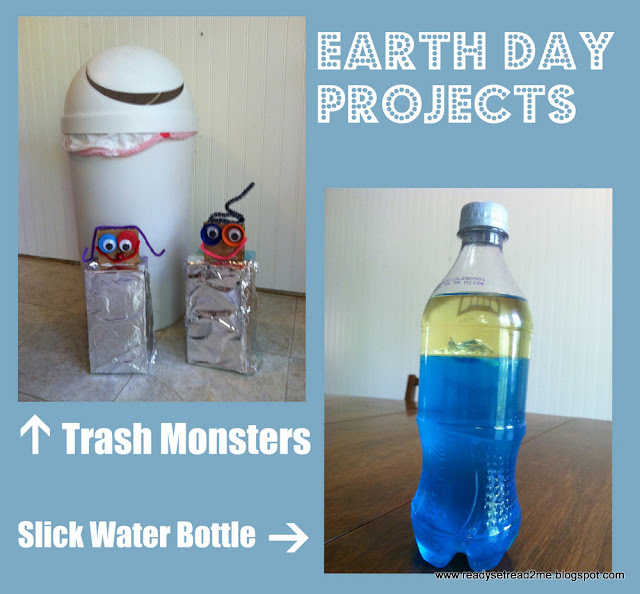 Greening Sam and Avery and Mommy Labs are hosting an Earth Day blog hop where you can find even more activities for celebrating our Earth. Be sure to check out all of the activities that are linked up or link up your own idea. The linky will be open through April 24th. Great crafts! Thanks for profiling this book! Wow! What a wonderful list to use over the next few weeks (and months!) Thanks for hosting!